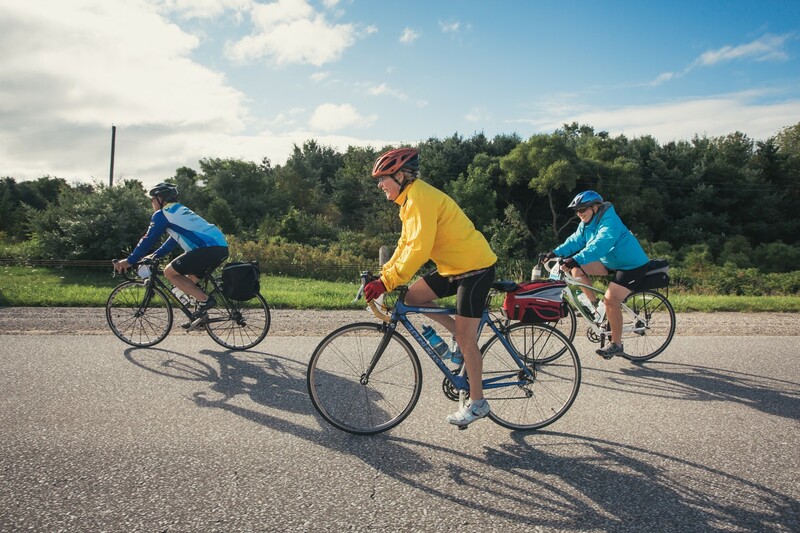 Haldimand’s 69km River Route, which is fully signed as the “Blue Route”, takes you through lovely countryside, along the Grand River, Lake Erie waterfront and into the charming small towns of Cayuga and Dunnville. Take advantage of the flat, paved low traffic roads that will beckon you to take a leisurely trip or pick up the pace down the rural straightaways. The Blue Route travels along only paved roads. The looped blue route starts at CAYUGA KINSMEN PARK, 61 Ouse Street South, Cayuga, with ample free parking located in the park. Take a moment and enjoy the view of the Grand River, a heritage river that boasts more than 90 species of fish and 250 species of birds. Your first leg of the trip takes you out of the park and onto Talbot Street headed west. Before you cross the bridge, you may want to explore the rural town of Cayuga. Grab a hot latte, scone or sandwich at The Carolinian Café or wander into a unique Cayuga landmark, Towpath On The Grand, which sells antiques, collectibles and one-of-a-kind garden and metalwork pieces. With Cayuga behind you, cross the bridge before leaving the main highway headed south onto River Road. This portion of the route has you travelling along the scenic banks of the Grand River. Plan for a quick deviation off County Road 50 by taking a left on Bains Road (note this road is gravel) to Bains Road Cider. The quaint farm produces small batch hard ciders and wines with fruit from local farms, and collected from wild fruit trees growing along fencerows throughout the County. Sample their new Sparkling Cherry Cider and take a bottle home with you. (Open weekend afternoons or by appointment or by chance). After a couple of jogs down to Lakeshore Road, you will enjoy breathtaking views of Lake Erie along the Great Lakes Waterfront Trail. This area is known as Evans Point and is home to Knight’s Beach Resort (open May 1-Oct 12) a seasonal and day campground and a favourite summer beach for locals. Knight’s Beach Resort has a half mile of sandy beach and has been recognized with a Trip Advisor Award of Excellence. As Lakeshore Road ends, a quick diversion north on Aikens Road, east on Kings Road and south on Johnson Road brings you back to the lake on Lighthouse Drive. This takes you into Port Maitland and the historic Port Maitland Pier and Lighthouse, where the waters of the Grand River meet Lake Erie. A perfect spot for fishing, taking pictures or resting while enjoying the view. Following Port Maitland Road you will pass the Dunnville Airport, which no longer operates but houses the No 6. RCAF Dunnville Museum. The Museum features artifacts from the WWII pilot training school that was once located on the site and a fleet of vintage and replica WWII aircraft. Check in advance for hours of operation or take a chance on your ride by. Continuing on Port Maitland Road takes you to the village of Byng, home to Byng Island Conservation Area. The 190-hectare park encompasses Carolinian forests, the Grand River, wetlands and creeks. Byng Island has the largest outdoor swimming pool in Canada, operating seasonally, which can hold up to 1,000 people. Overnight camping available on site. The park closes October 15th. Fuel up with a hearty pasta meal, just like dad used to make, at Julia’s Bistro or view the Culinary Guide which lists restaurants serving local fare. Just feel like a coffee, some baked goods and a chat with fellow cyclists? Don't miss the Flyer's Cafe, a popular destination for local and visiting cyclists. Sweet Retro-spect is a candy store that has all the retro candy you remember from your childhood, along with store-made popcorn in interesting flavours and everyone’s favourite flavours of ice cream. Cheap Shabby Chic is a charming store that re-purposes old furniture, has interesting home décor and bespoke items. They sell charcuterie boards that are made locally by a Dunnville resident. The Dunnville Farmers Market operates Tuesday and Saturday mornings, offering fresh local produce direct from growers in the area. The market building was recently rebuilt and sits next to a waterfront park. Buckner’s Source for Sports, a locally owned sporting good and service retailer offers bike repairs, if needed. As you head out of town, you will come across Dunnville’s mascot “Muddy”, the largest mudcat sculpture in the world. Muddy is a 50-foot long, 27-foot high statue which sits in Centennial Park at the western entrance to Dunnville. The mudcat has long been associated with the town especially through its sports teams and proximity to prime fishing. This is a great opportunity to take a selfie before heading back to Cayuga via Main Street West/Hwy #3. Glimpse the river as you travel west along County Road 17 and head north on Junction Road, west on Concession 1 Road and back into Cayuga. Be sure to plan a few last rides before the winter arrives when you’re stuck indoors and can only dream of the spring two wheeled adventures to come. This two-day ride begins and ends in the town of Caledonia, taking riders through a mix of rural landmarks and riverside views. Make sure to plan a stop on the sandy shores of Lake Erie at Knights beach resort, a certified bicycle friendly business, for a bite to eat before heading inland through rural landscapes rich in Haldimand’s agricultural bounty. This route is suitable for cyclists with experience and comfort in riding on roads with low traffic at low speeds and paved shoulders. Cyclists should bring spare bicycle parts, extra water and light snacks for longer rural stretches of road. Parking is available at accommodations or at the Caledonia Fairgrounds. Vehicle Parking/Transportation: Park at booked accommodation in Caledonia or at the parking area at the Caledonia Fairgrounds. Download the Cycling and Hiking Map for the full route as well as additional routes through the county, or order a print copy. Visit Haldimand County’s website for other things to see and do. Looking for a more organized ride with support along the way? Consider riding in the local Dunnville Grand Tour which runs annually in August, with routes from 25-160 kms. Find certified bicycle friendly businesses in Haldimand County at www.ontariobybike.ca/haldimand. Photos provided courtesy of Ontario's Southwest.